Are you planning a great off-road adventure? 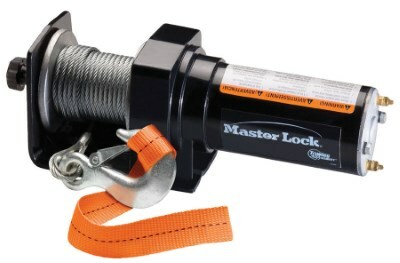 Check whether you have taken the most important thing with you-a portable electric winch. Otherwise, you risk getting stuck in the mud or somewhere else. Believe, that with the help of a high-quality winch you will be able to deal with any kind of problem quickly and easily. It will become your reliable helper. However, today there are so many models and brands of winches that it is not easy to make a decision on which one to choose. Let’s have a look at the collection of the most functional models. Top-5 Popular Electric Wiches: Choose the Right One for You! 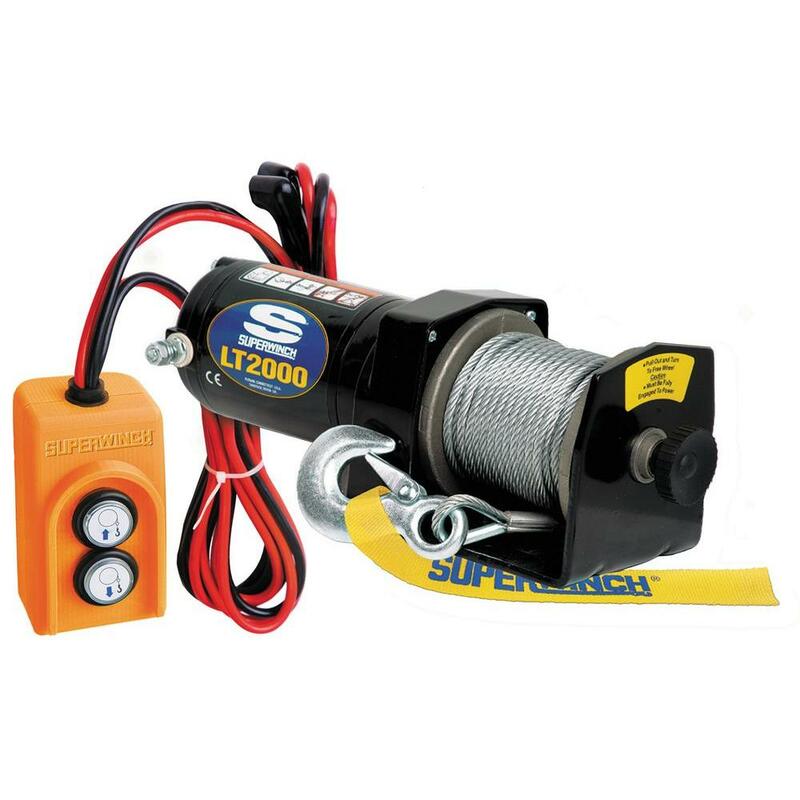 If you want to be sure that your adventure won’t end when facing the first trouble in the form of a swamp or mud, get the top-notch quality winch. How to find the right one? Here, you will find only the best most powerful models portable winches for your vehicle. Make your off-road experience really great with the following winches that have gained popularity among drivers. There are no cons in this model. The only one that can be considered a small drawback is the necessity to find a special place where you will keep it. Are there any disadvantages? There are no cons! If only the need to get a special cover for the winch to enjoy its durability. The winch has a budgetary design: the motor is combined with the gearbox on one side of the winch, and on the other side of the drum is just a metal wall with a switch of free unwinding. It is equipped with an engine power of 1 hp. and very economical in relation to your battery. The steel cable of length 15.2 is wound on an aluminum drum. A special feature of the equipment is the presence of a block of pulley block for increasing the tractive effort twice. With the help of the unit, you will get a winch with a pull of 4000lbs. Of course, a similar unit can be bought for any winch, but here it is already bundled and you will not have to buy anything. Holes for fastening are not made as on the winches for large ATVs for 4 bolts, but for 2 bolts. Interbolt distance is 80 mm. 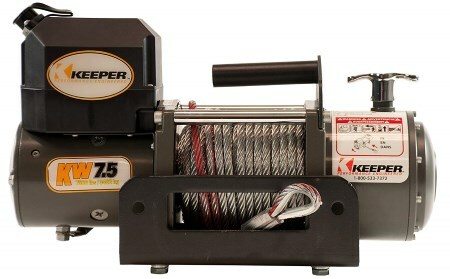 Also read one more review on Superwinch – Terra 45 ATV winch. 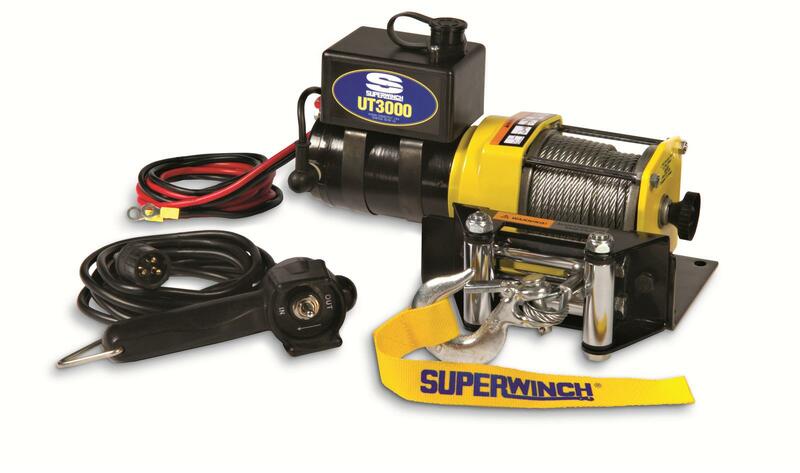 Superwinch is a well-known brand, which produces high-quality winches at a reasonable price. The model UT3000 has a pulling force of 3,000lb (1,360kg). It has the mounting plate and the roller fairlead. Dimensions of the winch (length x width x height): 304.8mm x 190.5mm x 177.8mm. As for the cons, it has none of them. The only thing for you to bear in mind is that you should keep it clean and find a proper place to keep it. 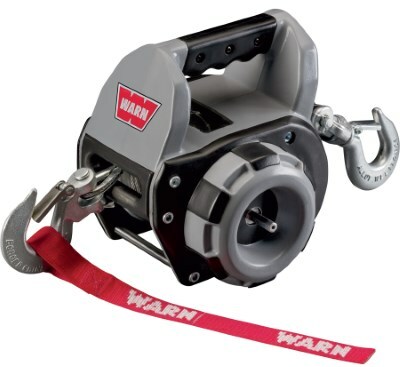 Unique WARN Drill Winch from the American manufacturer is a great option to choose. It is used to move or lift a load of up to 230 kg. The winch is capable of moving the car on a flat or inclined surface (e.g. loading on an evacuator). The main feature of this model is that it is driven by a hand drill or a screwdriver. You just need to insert the drill into the connector on the winch and you can start working. Now, you have a clear picture of the features, which the most popular electric portable winches have. Hope that this review of the best models will be helpful for you when choosing the right helper for your vehicle. Enjoy great off-road trips and don’t forget to take a portable winch with you!